"Turn away from it, dear boy! We're now in the world of The Celestial Toymaker, and that screen is hypnotic. He's trying to dominate your mind!" 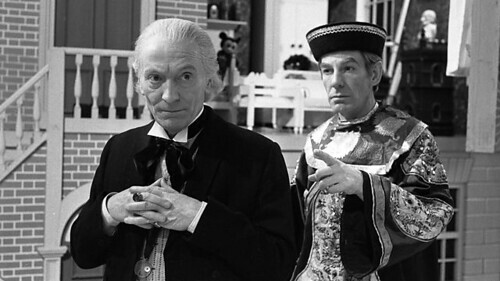 The Tardis is in the domain of the Celestial Toymaker, a Mandarin like figure. He has compelled the crew to play his games to regain the Tardis. 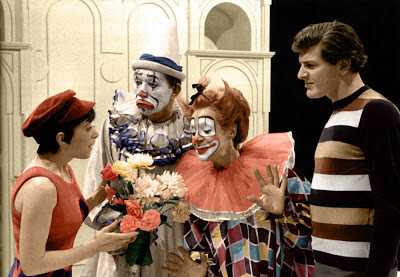 Steven & Dodo are forced into playing against the Toymaker's clown dolls which he has brought to life, whilst the invisible Doctor plays the Trilogic Game. Steven and Dodo win their round of Blind Man's Bluff discovering the clowns are cheating, but the Tardis they find at the end of the game is a fake. Welcome to one of *the* oddest Doctor Who stories ever. VERY highly thought of by fans who saw it on first broadcast it's reputation has slipped somewhat since it became widely available in audio form, for the first three episodes, and the fourth episode which was recovered during the 1980s. Whenever I listen to the first 3/4 of the story it just sounds very odd to my ear and I think moving visuals would help no end. Unfortunately this is one of those stories for which there are no telesnaps existing so we don't know what a lot of it looks like. The are, however, a number of high quality colour publicity photos covering almost all the credited characters and cats so we've a pretty good idea how they looked. STEVEN: Hey! Look! That's me! STEVEN: Here, on this screen! STEVEN: Here! That's me on the planet Kemble! DOCTOR: But I believe I now know where we are. STEVEN: It's changed again. There I am in Paris. DOCTOR: Now turn around this instant! Turn away from it, dear boy! We're now in the world of The Celestial Toymaker, and that screen is hypnotic. He's trying to dominate your mind. DOCTOR: There is nothing there. Do you understand me? There is nothing there at all. You must believe me. STEVEN: What was it? What happened? DODO: What's the matter, Doctor? I couldn't see anything on the screen. DOCTOR: Come here, child. Now whatever you do, you must not allow yourself to be trapped into looking at it. We visited Kemble in The Dalek Masterplan and Paris in The Massacre. Obviously there's some sort of visual representation there but is it still photos or actual footage from the story? Either way it's the first time something from a previous story has been shown, rather than just being referred to, in Doctor who. TOYMAKER: Just watch over there. DODO: It's me the day my mother died! DOCTOR: Turn away from it this instant! We knew Dodo was an Orphan, who lived with her Aunt, from her introduction at the end of The Massacre part 4. STEVEN: What's this extraordinary place? DOCTOR: Well, I'm not quite sure, dear boy, but it's, it's somewhat familiar. DOCTOR: You! I might have guessed. TOYMAKER: Of course. I've been waiting for you a long time. DOCTOR: You will kindly cease this practical joking, and let us go at once. TOYMAKER: Patience, Doctor, patience. You've only just got here. Relax. It's so nice to see you again. DOCTOR: And now you have, so let us go. TOYMAKER: You're so innocent, Doctor. The last time you were here, I hoped you'd stay long enough for a game, but you had hardly time to turn around. DOCTOR: And very wise I was, too. You and your games are quite notorious. You draw people here like a spider does to flies. TOYMAKER: How absurd. It amuses me to give amusement. DOCTOR: And should they lose the game they play, you condemn them to become your toy forever. TOYMAKER: That is one of my rules, certainly. But if they win, they're perfectly free to go. DOCTOR: And if I refuse? TOYMAKER: Then you lose by default. Is that what you choose? DOCTOR: No, I do not. I should never have left the Tardis. TOYMAKER: You're so insatiably curious. That's why I ensured that the scanner would be blank. I knew that would bring you out. DODO: Who's the Celestial Toymaker? DOCTOR: He's a power for evil. He manipulates people and makes them into his playthings. But the Toymaker has the Tardis and like many early stories the Tardis crew are forced to participate in events because it's the only way to get the Tardis back. TOYMAKER: So you still think that you can pit your mind against mine? DOCTOR: Of course I can. TOYMAKER: Good. I hope that the time you have spent dabbling in your researches round the universe hasn't dulled you. I need you. TOYMAKER: Yes. I'm bored. I love to play games, but there's no one to play against. The beings who call here have no minds and so they become my toys. But you will become my perpetual opponent. We shall play endless games together, your brain against mine. DOCTOR: As you said, if I win the game, I can go. TOYMAKER: So you can, Doctor, so you can. But I think you will lose. The Doctor is playing the Trilogic game, which is based on The Towers Of Hanoi. Counters of decreasing size from top to bottom are arranged on the first post. The object is to move all the counters to the third post. Only one counter can be moved at a time. No counter can sit on one smaller than itself. Move counter 1 from Tower 1 to Tower 3. Counter 1 from Tower 2 to Tower 3. Counter 1 from Tower 1 to Tower 3. Well I thought they were funny when I heard them at University! 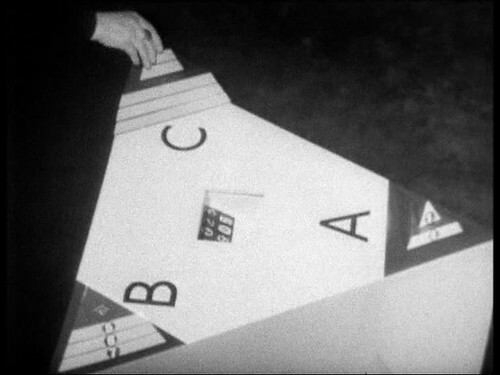 Peter Purves kept the Trilogic game after filming. Believing it was bringing him bad luck preventing him from finding work he threw it away and was the next week offered the Blue Peter job. 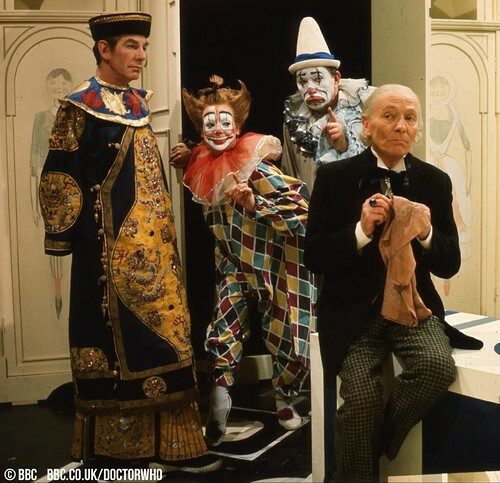 The main guest character for this series, the Celestial Toymaker himself, is played by noted actor Michael Gough, who you may know as Alfred from the 80s and 90s Batman movies. He's got one return to Doctor Who, in 1983 as Hedin in Arc of Infinity, but may well have reprised the role of the Toymaker in The Nightmare Fair if the planned 23rd season of Doctor Who hadn't been cancelled during 1985. At the time he was married to the actress Anneke Wills who we'll be seeing in a few weeks time.